Whip together egg yolks and honey. Add milk and oil, followed by sieved flour and cocoa powder. Whip together egg whites and sugar until a soft peak is obtained. Fold egg yolk mixture into egg white mixture. Spread out on a tray with silicone sheet and bake at 200°C for 9 minutes. Hydrate gelatine in 15 g of water. 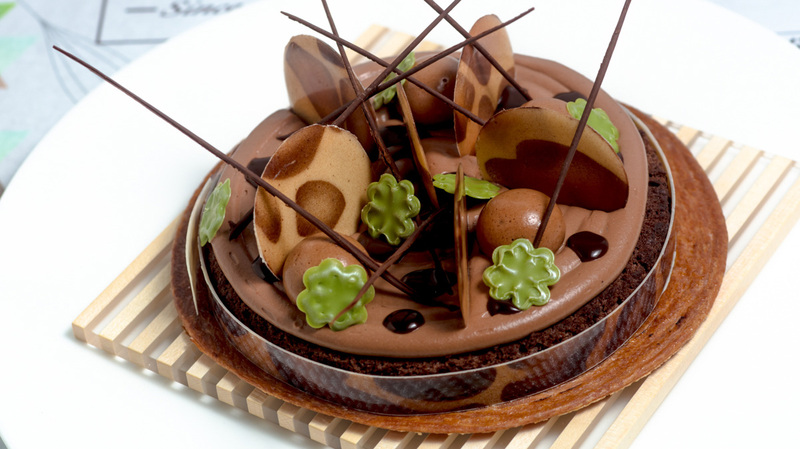 Make ganache by heating 82 g of water and mixing it with lecithin, gelatine and chocolate. Fold ganache into hazelnut paste. Whip together egg whites with dextrose and glucose powder. Mix with ganache. Mix all ingredients in a pan and bring to a boil. Add gelatine. Cover with cling film and store in refrigerator. Safe for butter, mix all ingredients into homogeneous dough with dough hook. Leave to rest in refrigerator for 1 hour. Fold butter into dough and double-fold twice. Leave to rest in refrigerator for 30 minutes. Single-fold dough and leave to rest in refrigerator for 1 hour. Roll out till 2.2 mm thick and form into a roll. Leave to rest in freezer for 3 hours. Slice with meat slicer and bake between 2 silicone sheets at 190°C for 12 minutes. Caramelise with icing sugar.